I’ve spent most of my life in the midst of sensational natural beauty living in foothills of Washington’s Cascade Mountains; these towering trees, massive mountains, and beautiful bodies of water have always captured my attention. Using photography as my medium, I feel the need to share the beauty of these places with others, and inspire them to find the beauty that surrounds them. One of the most magical locations in Washington for me can be found in the heart of Snoqualmie Pass. Just off of Interstate 90, Gold Creek Pond is both easily accessible and absolutely breathtaking. Upon arriving at the parking lot, follow a very short trail to the left and suddenly, you are immersed in a landscape so vast and jaw-dropping that I found myself literally at a loss for words. You can expect picturesque mountain peaks reflected in the crystal clear alpine pond in the foreground. And this is just the picnic area, (which I recommend taking advantage of to experience a meal like no other) continue around the pond’s mile long loop to take it all in. The first time I visited Gold Creek was in the springtime, and about half of the loop was still covered in snow so if you visit during the autumn, winter, or spring, expect snow. The loop trail treats you to different perspectives of the pond and mountains as well as informative placards detailing the history of the area and the animals that inhabit it. Multiple other times throughout the summer I have re-visited Gold Creek Pond and found that each time is a new, yet just as encapsulating experience as the first time. As a photographer, sunrises and sunsets often provide the perfect lighting for our photos and experiencing both a sunrise and sunset here will leave you absolutely awestruck. During both sunrise and sunset, the pond and mountains reflect deep blue colors while the mountaintops are lit up with brilliant oranges that are provided by Washington’s stellar sunsets. 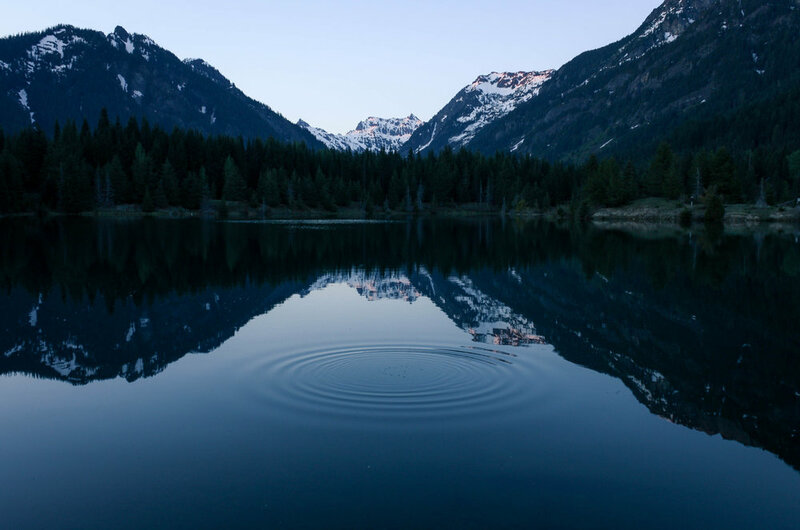 If you live in the Seattle area or find yourself there and want to experience something almost otherworldly, yet extremely accessible to all, Gold Creek Pond is the place to go. Just don’t forget to appreciate and respect the landscape that inspired me and will hopefully inspire you as well.